Security-focused Android phones have been popping up left and right over the years, but they always leave us wanting more. Today we’re looking at a device that truly takes a different approach and gives us a unique addition to the Android ecosystem. Enter the Turing Phone, a smartphone promising a set of foolproof security measures inside and out. It can be said this device looks like it’s made by a boutique brand like Vertu, but Turing made a handset without those excessive price points such niche products are usually plagued by. As we mentioned above, this phone prioritizes security, offering a full set of features and characteristics that will ensure your data is completely safe. Looking at the hardware, we can begin by contemplating the material choices Turing Robotic Industries (TRI) chose for their unique handset. The phone is made of a very specific type of metal that goes above and beyond our current industry standards. This metal goes by the name of liquidmetal, an amorphous metal alloy created by a mixture of zirconium, copper, aluminum, nickel and silver. Combining this unique variety of metals results in one of the strongest materials we have seen any smartphone being built out of. I was given a small sample of this material, to play around with, and found that it was nearly impossible to break or bend. Dropping this metal to the floor really gives off a unique sound that corroborates its quality. This is not the only material protecting the Turing Phone, though. Look around the device and you can find some pieces of polycarbonate and aluminum, as well. This is a very solid phone that should withstand enough shock to handle some tough drops. Furthermore, the Turing Phone is able to take a dive into the pool, but this is no usual waterproof application. Turing made sure to coat both the outside and inside of this handset. Every single piece within the smartphone is protected, so even though there are ways water can get into the innards of the phone, all the user would need to do is shake off excess liquids and go on with his day. The Turing Phone features a fingerprint reader, but it is placed in a unique area of the phone. Turing has decided to put this reader on the side of the device, which works well when you consider it is placed in the general area where fingers usually rest. Turing Robotic Industries wants this phone to be as secure as possible, and ports can be a vulnerability. The Turing Phone comes with no excessive hardware ports or standard technology. They have gotten rid of the micro-USB port and replaced it with a proprietary magnetic charger that only works for charging the device (no data transfers). In addition, the device comes with no 3.5 mm headset jack, as Turing would prefer that users stick to Bluetooth for their listening needs. 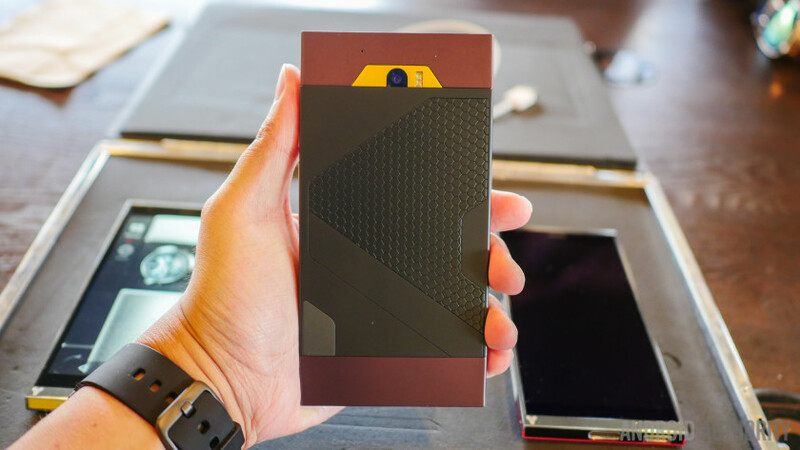 In an effort to keep the Turing Phone experience truly private, the phone maker has decided to also take a whole different take on the Android OS. For starters, there is a 2-step verification to keep anyone from accessing your device. One would need to use the fingerprint reader, as well as inputting an on-screen code. We can’t tell you too much about the actual software, as Turing Robotic Industries had nothing but some prototypes. A design language that could be appealing to some is present, but not finalized. The manufacturer tells us the UI will change once the phone is released, but we did get to see a bit of the current software state, which might be similar to what we see once the phone hits the streets. Needless to say the interface looks completely different to what we are used to. You can swipe between home screens and pages by sliding your digit left and right. And it’s possible to swipe halfway to access certain settings and action buttons, making for a very convenient shortcut area that doesn’t waste space at all times. I have to say it does look very sleek, and it’s refreshing to see someone giving Android a unique look. The Turing Phone certainly assimilates the look and feel we see in certain sports cars. It’s a beautiful device, but we are more impressed by its build quality and complete security measures. Security was the #1 focus for Turing, and they have gone all out to protect users from any attack possible. Of course, a closer look will be needed to see whether the promised security measures are as effective as Turing claims. Assuming it’s the right phone for you, it will also be a pleasure to learn about the prices. Phones with this kind of attention to detail and specifications come in at a pricey range, but Turing’s prices start at $610 for the 16 GB version. Meanwhile those who need 64 GB or 128 GB will have to pay $740 and $870, relatively. You will be able to pre-order them beginning on July 30th, which is not that far off. We are getting a review unit in due time and will make sure to put this phone through the paces. Interested in this unique piece of technology? Make sure to keep it tuned to Android Authority for our full take on the Turing Phone. How many of you feel the need for this type of security? I can certainly see certain high profile companies adopting these phones, especially considering their accessible pricing.